Concert has reached an important landmark for its 88 Scott development: the vertical neighbourhood is moving forward and the demolition process has just begun. “We’re thrilled to have reached this important milestone,” says Catherine Diraison, Broker of Record for Concert. Though the high-rise will incorporate modern amenities and a sleek design by Page + Steele and IBI Group Architects, the structure will pay tribute to the past as well. The condo will incorporate the mid-century architecture of the current building on site. Concert is moving quite carefully through the demolition process. Built in 1951, the existing structure’s limestone facade will be maintained for the podium of the building, adding a distinctive texture to the exterior of the condo. History buffs will similarly appreciate the surrounding neighbourhoood. The collection of historic buildings in and around St. Lawrence Market are just about unmatched within Toronto. 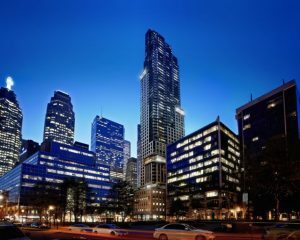 And with the theatre district, financial district, Berczy Park, Rogers Centre and countless amenities close by, it’s no wonder that 88 Scott earned a perfect walk score. The 58-storey tower will feature a number of amenities including the “Core Club” fitness centre, a screening room plus the split-level Sky Lounge. Available units range from studios to 3-bedroom designs of more than 2,900-square feet. Most range in price from $400,000 to $800,000. 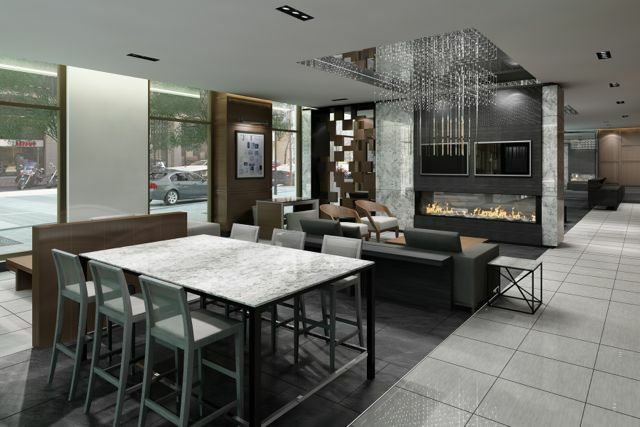 For more information email 88scott@concertproperties.com or contact their sales centre at 416 216 8588.